A creative way to make breakfast for your family healthy, fast and transportable, for on-the-go lifestyles. These days, everyone is in a hurry, and for those of you with school age children, it is going to get even more hectic as kids go back to school. Wraps are a great, healthy way of getting everyone fed during those crazy mornings when grab-and-go is essential. Keep the extra bucks that would have been spent on drive-thru breakfasts, and also keep your family from eating extra fats, calories and preservatives. 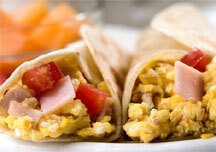 Wraps have long been a lunch favorite, but they are equally delicious for breakfast meals. The packaging of a variety of ingredients in a soft shell keeps the mess to a minimum, and can usually be prepared at a low cost. One of the best parts of a wrap is that you can tailor it to fit many taste pallets. Let's start with the base. The base to a wrap is a tortilla. They are inexpensive and easy to store. Tortillas are common in corn or flour varieties, but because of increasing popularity, they can also be found accented with spinach or sun dried tomatoes., These are typically called wraps when sold in stores. And for health's sake you can find them in whole wheat! Warming tortillas in the microwave for a few seconds will make them more pliable and less likely to crack. Now for the fun part! The fillings. This Is the part of wrap making that lets you really get creative! You can go for a southwestern flair with more of a breakfast burrito, or fill it with fruit and cheese, or keep it old school with peanut butter and jam. You can even go sweet with some pie filling (maybe save this one for dessert). Here are some of my favorite fillings. Breakfast Burrito: Starting with a filling of scrambled egg, mix and match extra fillings to taste, including sauteed onion, chopped green pepper, jalapeno, mushroom, corn, avocado, tomato, and whatever cheese you prefer. You can add cooked diced potato and add precooked meat such as ham, sausage, bacon or Canadian bacon. For some extra protein add refried beans. Finish it off with salsa, wrap it up, carefully tucking in the tails so it doesn't leak out. My often-excited husband has a tendency to top the tortilla with an over-abundance of filling ingredients, making it difficult to wrap. So, go easy and be sensible with the fillings! This diagram demonstrates what I mean, if you are a first time wrapper. Start with two sides, fold them both in and over the filling, then on the opposite unfolded sides, roll it evenly. I wrap these in plastic wrap, and store in a freezer bag. Doing these in a mass batch takes some time, but it saves you in the long run. The breakfast wraps can be pulled from the freezer and heated for a minute to minute and a half in your microwave for a spicy on-the-go breakfast. *Tip for kids in the car, leave the plastic wrap on the bottom half of the burrito to prevent leakage. Fruit Wrap: This is one of my favorites and got me through early mornings in college (and I lost some of that freshman weight). I used a filling of chopped or shredded chicken, thinly sliced apple and chopped walnut. Sometimes I would take out the chicken and use shredded cheddar, and when I ran out of apples and didn't want to walk through the Idaho snow for more, I would just fill with chicken and cheese with some salsa. You can warm before eating to melt the cheese, if you desire. If you added apples you will still get that crunchy apple texture. Old School Favorite: For less adventurous tastes, stick with something they know. Peanut butter and jam go in a wrap just like the favorite PB&J's of our youth. Ham and Cheese Wrap: Layering sliced cheese and luncheon cut ham in your tortilla, with sauce or condiment of your choice results in another non sweet breakfast option, and can be served hot or cold, and made ahead and stored in the freezer. The options for wraps are endless and provide a healthy, on-the-go alternative for your breakfast needs. For more on the go breakfast ideas, check out the Cook'n Breakfast Cookbook, which is fully downloadable on your PC. Using the Cook'n software can aid you in filling out your shopping list too, further simplifying your on the go lifestyle! I would really enjoy hearing about your favorite fillings for breakfast wraps, do you prefer spicy, sweet or somewhere in the middle?